I’m in a rush to finish my costume because we're now going to the Renaissance festival several weeks earlier than planned! 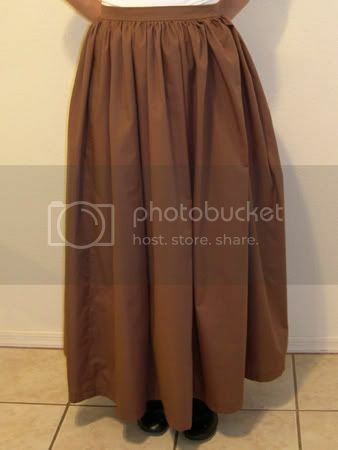 I’ve completed the skirt and the shirt; I still have to make the shawl and sew the final seams on the bodice/vest. When it’s all done I’ll post a picture of the completed outfit. What I Did: Pretty simple, just followed the pattern. I did have to hem the bottom more than they suggested or else I would’ve ended up walking on it! What I Liked About the Project: Very quick and not too many pieces. And I finally learned to sew on a zipper correctly! What I Didn’t Like About the Project: Again, I had problems in fitting the skirt. The first waistband I attached to the skirt was too small and I couldn’t zip it up, but when I made a second waistband in the next size up it was too big and won’t stay at my waist. I gave up and stuck with the second waistband though I may have to cinch it up somehow to keep it in place. What I Did: Exactly what the pattern said, except I left off the lace/ruffles at the collar and sleeves and I again hemmed a bit more on the tail than they suggested. What I Liked About the Project: Um, it’s not too small? What I Didn’t Like About the Project: I’m not super happy about this shirt. There is way too much excess fabric, considering I have to tuck most of it inside a vest! I’m annoyed since this shirt was DESIGNED to go under the vest I made. 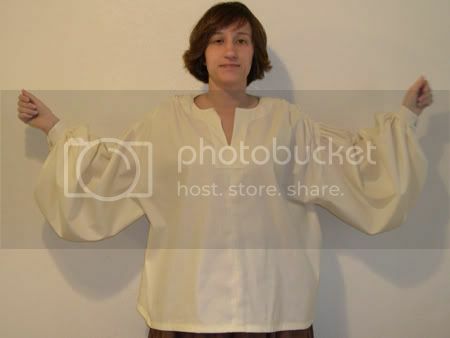 Look at the size of the armholes and sleeves! I think it’s going to end up looking silly when I try to cram it under a vest and everything ends up poofing out the sleeves. But since the fabric to make this shirt cost more than all my other fabric supplies put together, I feel like I have to use it. Plus I really don’t have time to research and sew a new shirt. We’ll see, maybe it won’t end up looking so bad.